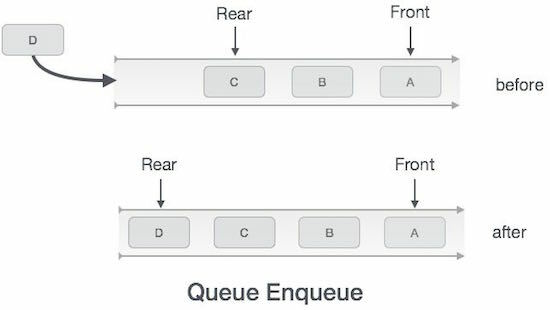 A queue is an ordered list in which insertions are done at one end (rear) and deletions are done at another end (front). The first element to be inserted is the first one to be deleted. Hence, it is called First in First out (FIFO) or Last in Last out (LILO) list. 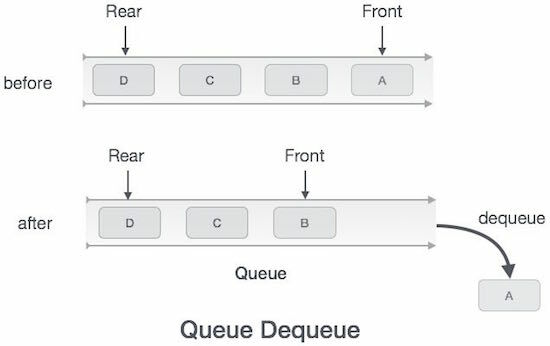 A queue is a data structure used for storing data (similar to Linked Lists and Stacks). In a queue, the order in which data arrives is important. In general, a queue is a line of people or things waiting to be served in sequential order starting at the beginning of the line or sequence. A real-world example of a queue can be a single-lane one-way road, where the vehicle enters first, exits first. More real-world examples can be seen as queues at the ticket windows and bus-stops. When an element is inserted in a queue, the concept is called EnQueue. When an element is removed from the queue, the concept is called DeQueue. DeQueueing an empty queue is called underflow (treat as Exception). EnQueuing an element in a full queue is called overflow (treat as Exception). 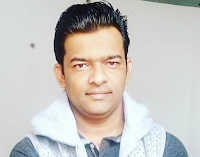 enqueue() − add (store) an item to the queue. dequeue() − remove (access) an item from the queue. peek() − Gets the element at the front of the queue without removing it. isFull() − Checks if the queue is full. isEmpty() − Checks if the queue is empty. In queue, we always dequeue (or access) data, pointed by a front pointer and while enqueuing (or storing) data in the queue we take help of rear pointer. Queues maintain two data pointers, front, and rear. Therefore, its operations are comparatively difficult to implement than that of stacks. Step 1 − Check if the queue is full. Step 2 − If the queue is full, produce overflow error and exit. Step 3 − If the queue is not full, increment a rear pointer to point the next empty space. Step 4 − Add data element to the queue location, where the rear is pointing. Step 5 − return success. Step 1 − Check if the queue is empty. Step 2 − If the queue is empty, produce underflow error and exit. Step 3 − If the queue is not empty, access the data where the front is pointing. Step 4 − Increment front pointer to point to the next available data element. Similar to other Queue Operations, executing DeQueue on an empty queue throws an “Empty Queue Exception” and executing EnQueueon a full queue throws a “Full Queue Exception”. Following are the some of the applications that use queues. Operating systems schedule jobs (with equal priority) in the order of arrival (e.g., a print queue). Simulation of real-world queues such as lines at a ticket counter, or any other first come the first-served scenario requires a queue. Asynchronous data transfer (file IO, pipes, sockets). Waiting times of customers at a call center. Determining the number of cashiers to have at a supermarket. There are many ways (similar to Stacks) of implementing queue operations and some of the commonly used methods are listed below.